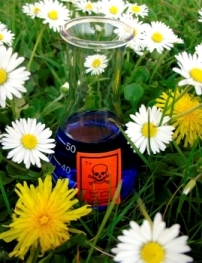 Beware of the toxic cosmetic ingredients commonly found in your personal care products. There are virtually no restrictions on the ingredients that may be used in personal care products since the FDA cannot require safety testing of products before they are sold to the public. The cosmetic companies themselves are held responsible for the safety of their own products. As a result and driven by profit rather than a concern for human health and well-being, personal care products are often filled with synthetic and hazardous chemicals. In fact, according to the Environmental Working Group (EWG.org) "under federal law, companies can put virtually anything they wish into personal care products, and many of them do. Mercury, lead, placenta extract -- all of these and many other hazardous materials that millions of Americans, including children, use every day..." Many of these ingredients are also linked to cancer. Biochemist and organic advocate Richard Bense has stated in the British newspaper The Telegraph that "we really need to start questioning the products we are putting on our skin and not just assume that the chemicals in them are safe". 1. Learn what goes into the products you are putting on your body on a daily basis. Become informed about common cosmetic ingredients. The best defense is to be informed about the products you buy. Choose carefully and avoid products with potentially hazardous ingredients. To this end, we have compiled a list of some of the most commonly used toxic cosmetic ingredients found in personal care products. This is not an exhaustive list, but we have tried to cover the most important chemicals that you should be aware of in order to help you to make more informed shopping decisions when buying personal care products. 1. Petroleum based products: Known by names like petrolatum, mineral oil, paraffin, paraffin oil, paraffin wax. Used in shampoos, hair relaxers, anti-aging creams, mascaras, perfumes, foundations, lipsticks and lip balms. These chemicals commonly used in cosmetic ingredients are byproducts of and derived from crude oil and may have known or potential carcinogenic (cancer causing) effects. They may also be contaminated with unlisted hazardous impurities such as 1,4 Dioxane and PAHs due to their manufacturing process. They coat the skin, clog pores, and interfere with the body's natural ability to eliminate toxins. 2. Sodium Lauryl Sulphate (SLS)/ Ammonium Lauryl Sulphate: Often disguised on cosmetic labels, especially those labeled as 'natural', with the description 'comes from coconut'. Found in shampoo, bath and shower products, and toothpaste. Used to degrease engines, used in car washes and garage floor cleaners. Used as an emulsifying and foaming agent. 90% of foaming products use this ingredient. --May cause damage to the liver, lungs, and immune system. --May cause depression of nervous system, diarrhea, and reproductive system disorders. --Damages respiratory tract and eyes. These toxic cosmetic ingredients are found in perfumes, hairsprays, and nail polishes. Phthlates are used as skin moisturizers, and to enhance penetration of skin. They are also used as plasticizers to soften plastic. --Known to have negative effects on the reproductive system and early development. --Act as hormone disruptors. Associated with premature breast development in girls and problems with reproductive development in male fetuses. 4. Parabens: Derived from petroleum. Also known as alkyl parahydroxy benzoates; and butyl, methyl, ethyl, propyl, or isobutyl paraben. Cosmetic ingredients that are found in deodorants, moisturizers, and some food items. They are used as preservatives. 5. Fragrance: Usually listed as 'fragrance' (in the US), or 'parfum' (EU). Commonly used in cosmetic ingredients and personal care products, fragrance may contain up to 4000 separate ingredients, although typically most products use an average of 50-100 fragrance ingredients. These ingredients have no restrictions and are not required to be listed separately. Often used to mask the scent of other ingredients or to make the product smell more appealing. Fragrance is added to most personal care products on the market. 95% of the chemicals used in fragrances are synthetic derivatives of petroleum. --Fragrance may have an effect upon the central nervous system, and interfere with metabolism, hormones, and act as endocrine disruptors. --These hazardous cosmetic ingredients can cause headaches, dizziness, breathing disorders, allergic rashes and other allergic reactions, skin disorders, coughing, vomiting, depression, hyperactivity, irritability, and chemical sensitivities. Found in skin lightening products and moisturizers. --A possible carcinogen, neurotoxin (substance which affects the nervous system), and a skin sensitizer. --Causes ochronosis, a disease of the skin which results in black and blue lesions on the skin and is irreversible. Found in hair dyes and cleansers. Known to be toxic to the human reproductive system and to impair development. 8. Mercury: Also known as thimerosal. Found in eye drops, ointments, and mascara. Has toxic effects on the human reproductive system and human development. May also be a carcinogen. 9. Triclosan: Also known as 5-cholor2 (2,4 dichlorophenoxy)-phenol. May not appear on the labels of cosmetic ingredients due to trademark associations. Found in liquid soaps, deodorants, mouthwashes, toothpastes, vaginal washes, and even clothing. An antibacterial agent that has been found in human breast milk and fish. Forms cancer causing dioxins when manufactured or incinerated. Irritates the skin and respiratory tract. May damage the liver. Has a narcotic effect at high concentrations. Used in facial creams, lipsticks, sun lotions, and mascara. Used as an antioxidant preservative. May cause behavioral changes and problems with reproductive system. Contains toluene (See number 8 above) Causes allergic dermatitis. Used in shampoo, body lotion, deodorant, sun lotion, makeup and color cosmetics. Used as an humectant, to retain moisture. 14. AHAs: Alpha-hydroxy acids or fruit acids, including glycolic, lactic, and citric acid. These cosmetic ingredients are used in bath and shower products, anti-aging and face and body products. Used as exfoliants and ph balancers. 15. PPD: Also known as p-phenylenediamine. Used as a dye. Found in dark hair dyes, black henna, and temporary tattoos.